Another amazingly manufactured LED grow light. 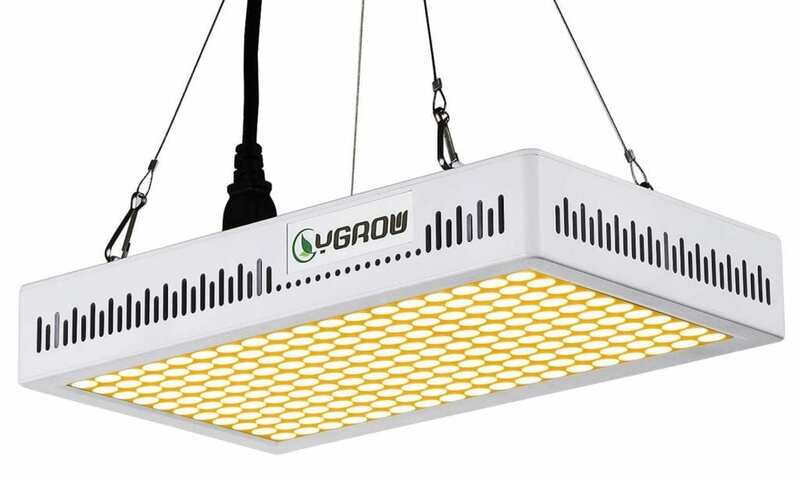 The YGROW 600W LED light is one of the newest entries in the LED grow light industry. 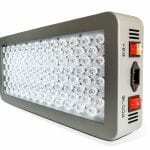 We are the first with an YGROW LED grow light 600w review. The YGROW has full spectrum, high PAR value, and it is more energy efficient than any HPS grow light. With great features, good coverage and a fair price, it is an option to consider for every indoor growing enthusiast. 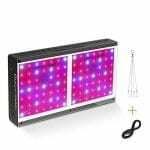 Interested in the best 600w LED grow lights? Check the article. YGROW 600w LED is designed for whom? The YGROW LED light 600w comes with features that every grower needs. In addition, it is energy efficient. It replaces a 1000 w HPS/MH while consuming only 150 watt, according to YGROW. The light also covers a large area and stimulates growing during different growing stages of plants. 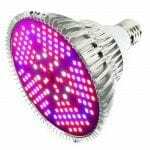 A reliable LED grow light that has numerous great features. Let’s discuss these features. YGROW LED grow light 600w comes with great PAR values and energy efficiency. As a result, It has a rated power of 600 watt and not of 1000w, such as YGROW claims. However, it only consumes 150 watts. This makes it an extremely energy efficient choice for indoor growing of cannabis. Moreover, the higher PAR value of about 612µmol at 18’’ hanging height shows that it delivers great yields. The full spectrum of the YGROW 600w is also a must-have for every LED grow light. 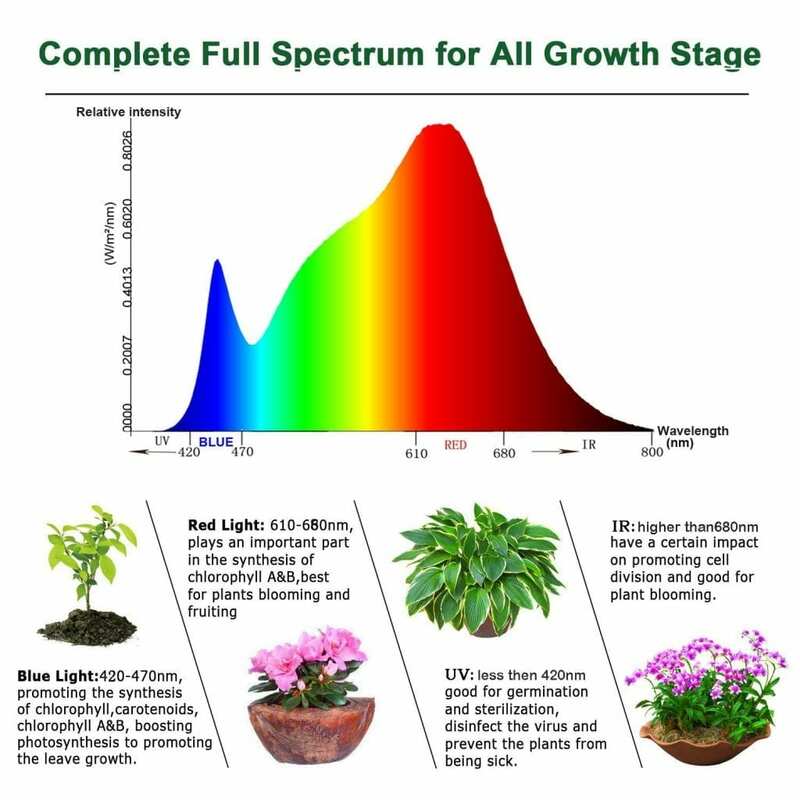 The full spectrum LEDs contain all the needed colors which cannabis needs for photosynthesis. These lights trigger the growth process, which is beneficial for indoor growth. All in all, the full spectrum range of 380nm-740nm including the UV and IR spectrum provides a good amount of light at the right parts of the spectrum. The YGROW 600w proves itself to be one of the safer choices among LED grow lights. It has a built-in cooling system and a temperature controller inside. Whenever the temperature is above 95 degrees, the light will be turned off and vice versa. The cooling fans run on high speed and are very quiet. 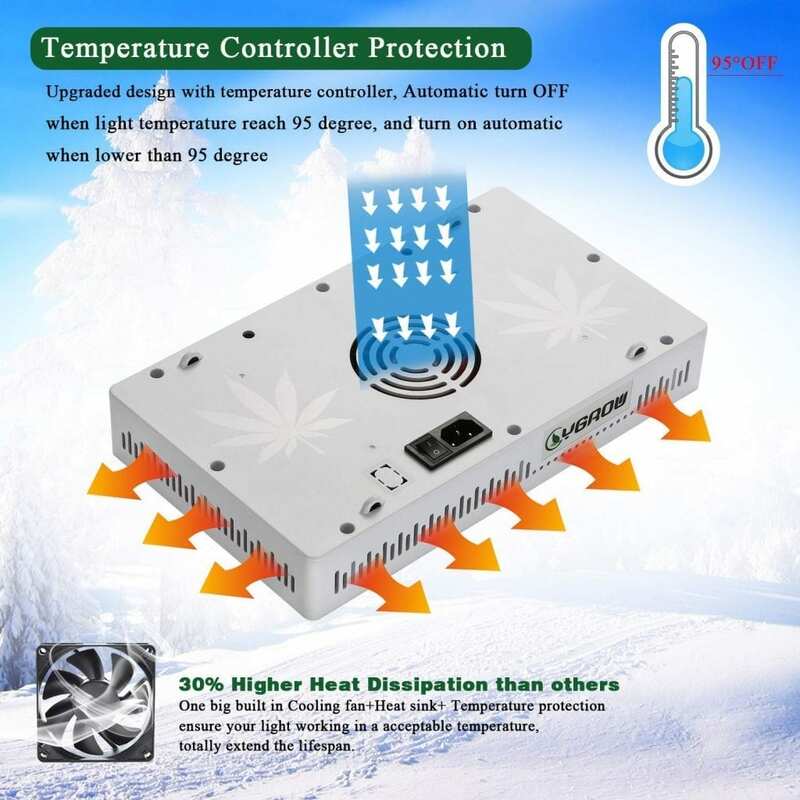 The heat dissipation is also very good in the YGROW 600w. The built-in reflectors of the YGROW LED grow light 600w help in saving power. 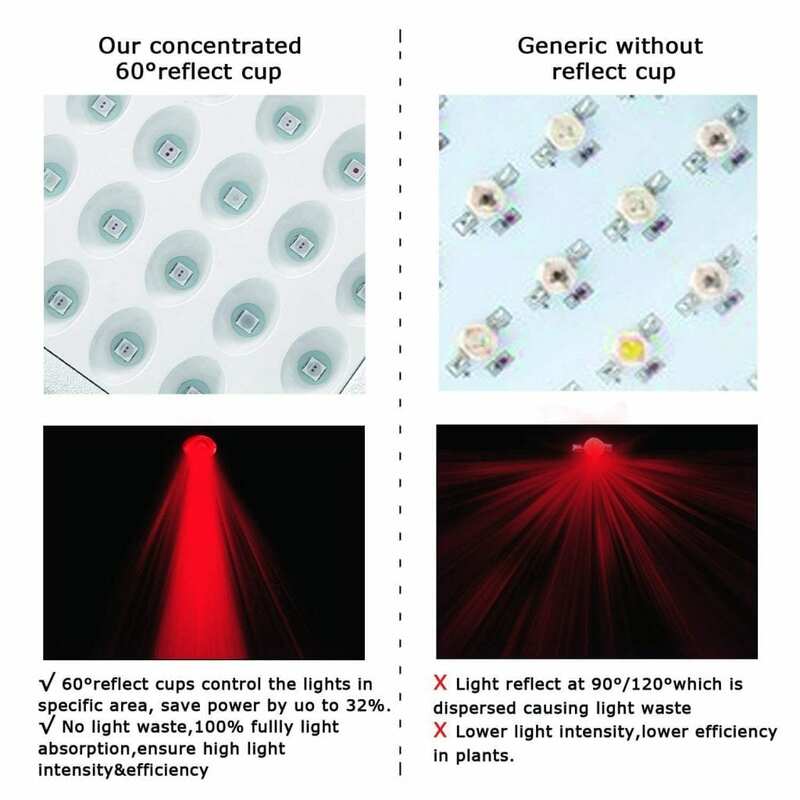 That is why the YGROW 600w LED is equipped with the 60 degrees reflecting cup. It maintains and focuses the light in a particular area. Thereby, the YGROW is saving power. This pretty much saves up to 32% of the power. It also makes sure that high intensity is maintained on a particular area so plants get more light focus and grow better. Coming with two years warranty, the YGROW 600 w LED is giving 100% customer satisfaction and services. Based on our experiences with the YGrow 600w, this LED light is specifically designed beginning indoor growers. The light covers about 3×3 feet as its core coverage (at 24”), but you can get a max coverage of 4×4 feet. Depending on your grow tent (3×3 grow tent, 4×4 grow tent), this light could be a perfect match for you. The YGROW 600w has a full-color spectrum, which makes it ideal to grow cannabis. A perfect choice for growers, this extremely bright light is great to work for long hours. Those wanting LED light with a good heat dissipation system like radiator and fans, this is going to be one to consider. Interested in seeing this light unboxed? Check out the video below and watch how it performs live in action. Overall, this YGROW 600w LED light makes itself a reliable, bright and efficient choice. It has full spectrum, great coverage, and cooling system, which makes it one of the best cheap choices available. If you’re starting out as indoor growing enthusiast and you want to cover 3×3 or 4×4 feet. This is a light worth considering. Are you interested in other LED grow lights? In this wattage range, this is probably one of the best on our website: Viparspectra 600w. Are you interested in tools for your growing room? We think a bud trimmer is ideal if you want to work efficiently. Also a PAR light meter is great for everyone. If you’re just starting out, you should check out our article on the best hydroponic systems as well. These are great if you want great yields.